Why would an investor care whether a money manager wears Louboutins or loafers? Because money--how to keep it and how to make more of it--is on everyone's mind. And research shows it pays to invest with or like a woman. Study after study shows that women invest differently than men. From less overconfidence, overtrading, and testosterone to a greater tolerance for market noise and a more consistent application of investment strategy, there are a number reasons why women approach investing in a unique way. Women create both cognitive and behavioral "alpha" with their investment style which contributes over the long-run to outsized investment returns. 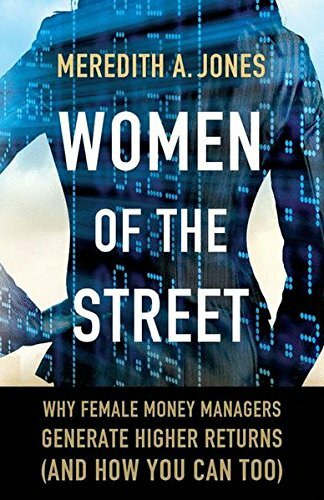 Women of The Street: Why Female Money Managers Generate Higher Returns (And How You Can Too) looks at behavioral and biological investment research to explore how women think about investing, and to determine why women may have a money management edge. The book then identifies and interviews 11 top female "market wizards" in hedge funds, private equity, venture capital, and other asset classes to see how women's innate investing characteristics translate in different strategies and markets into significant profits. The conversations provide market wisdom that can enhance your portfolio, regardless of your gender. It also provides interesting "insider information" on the financial industry. And finally, Women of The Street provides role models for the next generation of female money managers.